For the last 6 months I have been working nonstop to get Ever Upward noticed, read, reviewed, Tweeted, Facebooked and loved. I have also been trying to maintain my sanity, marriage and relationships. I have also been trying to not go broke while pushing out my debut book without a big publishing house behind me and no experience in marketing or PR. All while seeing the most clients I ever have each week and being the best therapist I have ever been (only because I work my own recovery). All this pushing and planting about topics that many don't want to talk about or even hear about. All this pushing and planting because I believe in myself, in my message and in the need for it. But now it is spring. Less than two weeks out from the bookstore launch of Ever Upward and I am realizing, again, the need to step back. Step back to watch what I have planted grow. Step back to make room for it to grow. Step back to give it back to Him. Step back to allow it bloom. As all of my work begins to bud, I am also beginning to be faced with one of my personal struggles. Because not everyone likes what I have to say or how I go about it all. But, no one has ever changed the world by being liked by everyone and the people who know me and know Ever Upward can trust that my intention is always to help. Besides, I only have room for those who are actually in the arena with me; living their lives every day with wholehearted courage. And yet, the perfectionist part of me also cringes at the thought of being disliked by anyone. Or worse yet, people out there saying negative things about me and my message. However, rising ever upward means not being defined by what others think of me and always choosing to shine my light no matter what. 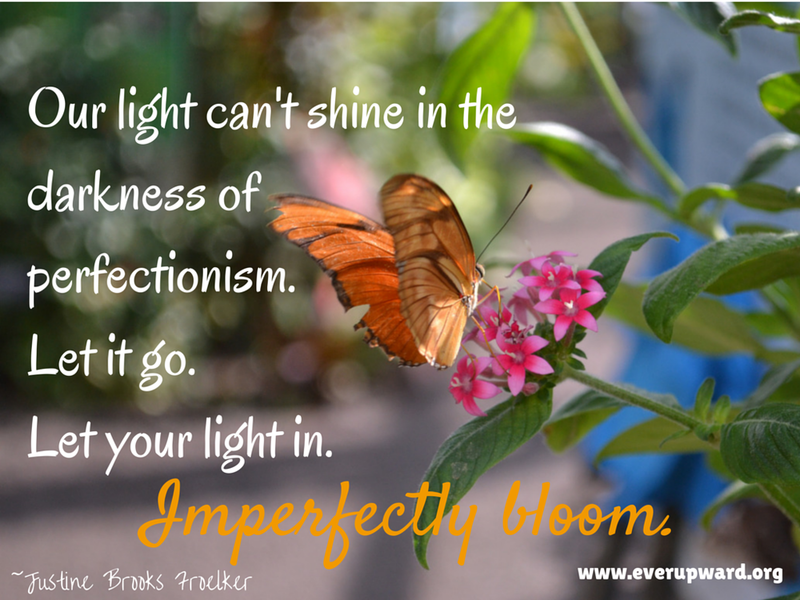 Because nothing is perfect and light will never shine in perfectionistic darkness, which means nothing will ever grow. This darkness almost got me recently when I received my first 3 star Amazon review that contained good constructive criticism. Now I am not delusional, I know those negative reviews are coming; just as I have learned that I will never please everyone. But this one was my first and it stung a bit. But just for a bit because I wasn't going to allow that perfectionistic dark to steal the moment. Because the truth of the review was that the better (and longer) half of the review was incredible and super supportive. If I focused on those 3 stars and the criticism for too long it would completely negate the positive part of the review. But, isn't that what we all do? You were told five exemplary points during your job review and you can't get the one thing your supervisor needs you to work on out of your mind. 95% percent of the evaluations are raving positive reviews and that measly 5% is haunting you. You didn't get those three jobs before your dream job that you actually got and yet you hold onto those rejections for way longer than they deserve. Give yourself permission to take the feedback, the rejection and the criticism in order to grow from it but then let it go. Because, we must give ourselves permission to celebrate and to actually pat ourselves on the back, especially when we deserve it. The crazy part is my 3 star reviewer reached out to me after I posted about my disappointment on my personal Facebook page and the Ever Upward Facebook page. You see part of my ever upward journey is to be honest and vulnerable on social media because that is real life. Just as my friend Jen of Daring Happiness says, "Facebook Happy" is our fault not social media's fault. Take a chance and post about your real life on social media and feel how much your life and the connections in your life flourish. My 3 star reviewer apologized and reiterated how much she loved my book and even offered to change the star review on Amazon. To which I wrote her back and thanked her for her apology but assured her it was completely unnecessary. And then, I thanked her for her criticism. She is now a significant part of this journey for me. I need to trust who I am, to know my message matters and will help others. I don't want to develop a tough skin because then I am not honoring the wholehearted and authentic person I am and want to be. But I do want and need to practice my recovery wholeheartedly, which means I get to learn and grow from criticism while also allowing the light in. My 3 star reviewer allowed me this practice: to let go of that perfectionistic dark in order to allow the light in. To let my light in. Because none of it can bloom without that light. Just 2 pledges left for the Thunderclap to go out to over 90,000 people on April 7th. Please help by signing up here! I am also slowly getting closer and closer to launching with 50 Amazon reviews, please help by clicking the Kindle version of the book and leaving your review of Ever Upward. Thank you so much!